Just so we're klear: The Kinetic Grand Championship is happening, people! 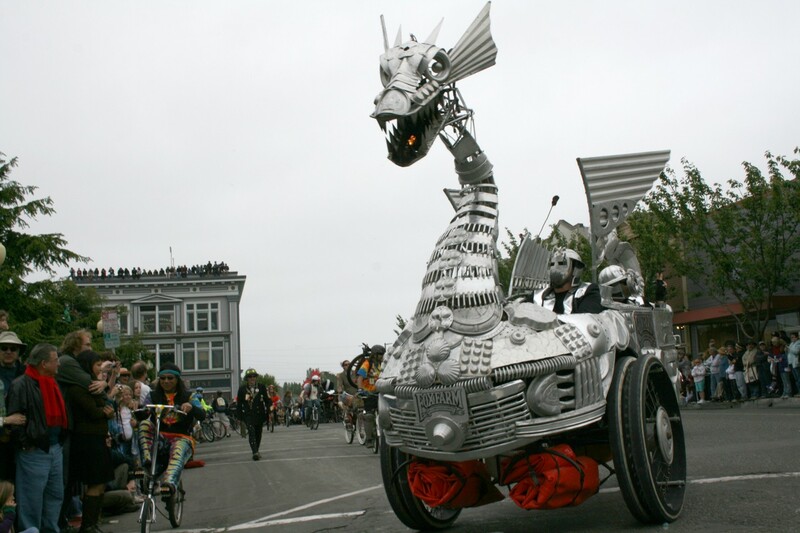 While some less-than-glorious kancellation kontroversy threatened to dampen this year's proceedings (see "Rutabaga Scramble," NCJ 5/19), a K-Universal truce was forged, papers were signed, krises averted and the Kinetic Sculpture Race, now in its 43rd year, will take place in all its Glory as scheduled from Saturday, May 28, to Monday, May 30. SATURDAY: It is possible that some may not have the stomach for three full days of Kinetic kraziness. If circumstance forces you to keep your kommitments minimal, konsider at least hitting the Arcata Plaza Saturday morning for the Kinetic Grand Championship Launch. All sculptures will be on display starting around 9-ish for viewing in pristine, un-kourse-worn condition. All are required to undergo safety inspections and brake checks prior to the LeMans Start signaled by the exciting noon whistle, when all sculptures circle the Plaza a couple of times before heading down the road. Ready for more? Follow the Race through the Arcata bottoms and on to Manila. If you're the type that slows down at car crashes, you'll want to make your way through the dunes to Dead Man's Drop to witness how easily gravity and sand can crush dreams. Those who survive the Drop will make their way across the Samoa bridges and finish day one at the Eureka Big Finish at Halvorsen Park. Kinetic people are known to party. Thus, there is the Super Secret After Party taking place at the Park that you should crash, with live music, a beer garden, bounce house (for kids only), food and general family friendly madness. SUNDAY: The Kinetic Krowd rises early -- not by choice -- on day two for the Kinetic Waterkrossing through Humboldt Bay near the Wharfinger Building. Again, if you like car crashes, we'll mention that you can rent kayaks from Humboats (www.humboats.com) to witness the karnage up close from the water. After coming to terms with hypothermia, kompetitors will head for a noon-ish lunch at Eureka Natural Foods before heading south down Hwy 101 through Loleta and on to Crab Park. This is when the true Kinetic Spirit takes over, at the super-extra secret overnighter (racers only, no spectators allowed). Here's a list of things you'd never think were flamma... Oh, wait. Vegas rules. Er, since the Kinetic Universe has had a rough year, we'll report that at Crab Park last year all racers sat in a non-flame-lit circle and sang "Kumbaya" before being tucked into their sleeping bags at sunset without incident. Expect similar uneventfulness this year. Nothing to see here, folks. MONDAY: With a healthy 12 hours of sleep under their belts, kompetitors pilot their machines across the mouth of the Eel River at Morgan Slough, wave to cows as they make their way through the dairy lands and speed toward The Glorious Finish Line near Hobart's old digs in the middle of town on Main Street. Secure your viewing area early to watch the glorious finishers as they start to trickle in in early afternoon. Later on Monday evening, the Kinetic Awards Dinner will grace Ferndale's Fireman's Hall and coveted ACE Awards will be handed out to deserving champions. After the ceremony, racers begin their annual 362-day-kountdown-'til-life-has-meaning-again. See you next year. For the best kinetic koverage throughout the race, make sure to keep your radio dial on KHUM 104.3/104.7 FM for the duration of the weekend. For more info, check out www.kineticgrandchampionship.com. For the (can we say this yet?) Glory!